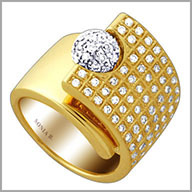 14K White and yellow Gold 1.325 ct Diamond Bypass Ring. Flash this ring for a dose of dynamic dazzle! The head-turning design is crafted from polished 14k white and yellow gold and features 99 round full cut diamonds. The diamonds ball and slight bypass look is full of interest and elegance. All diamonds are set in prongs settings for a total weight of approximately 1.325ct. G-H in color and SI.